Why Advertise with an LED Sign? LED Signs are the most dynamic and effective signs you can buy for your business. LED signs are the most EYE-CATCHING and POWERFUL signs for your business - bar none. But most importantly, LED signs create the biggest RETURN ON INVESTMENT for any type of media available to advertise your business. That's really the bottom line, isn't it? You want a powerful marketing tool to bring people into your business so they will get to know you and your products and services. 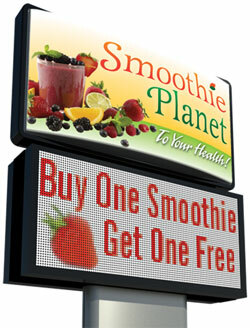 LED signs can be programmed to show sales and promotions on the fly! Many of our customers have promoted "Incredible Sale! Today only!" and brought in more business than they knew what to do with! LED signs can welcome customers both old and new and make them feel welcome into your business. It's about the personal touch. LED signs can help your community by announcing community messages and events. Your community will appreciate it and REMEMBER YOU for it. Who do you think they will purchase from the next time they need the product or service you provide? LED Sign Digital Advertising is less expensive than traditional advertising. First, the cost of running an LED sign is very cheap. LEDs are energy efficient. 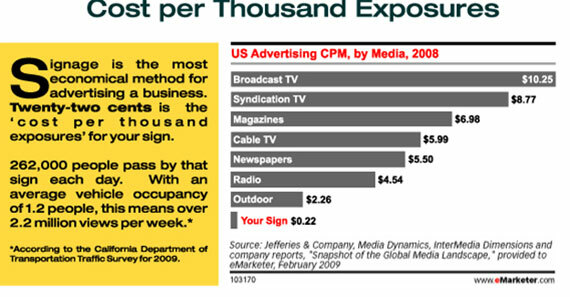 In studies done by advertising media experts, an LED sign is the least expensive way to advertise when you measure advertising PER 1000 VIEWERS. It costs less than a dollar per thousand viewers for an LED sign - television can be well over $10 per thousand viewers and newspaper can be well over $5 per thousand exposures. Did you know that 85% of your potential customers will pass your establishment on average 10 times per month?!? Having that sign up and running all the time will continually remind them that you're there and have what they need! Turn "Drive-By" Traffic Into "Walk-In" Customers Today. Capitalize on impulse buying with LED Signs. Haven't you driven down the street with no intention to buy anything but saw a sign of a business and thought, "I've wanted to get something from there!"? LED signs can SHOW AND TELL people what you have to offer on the inside of your store.